Sometimes people make contact with Ashwood Therapy because they feel that they are 'stuck in a rut' and have no options for moving forwards. They are not happy with their current situation but can't see any way out or any way to effect change, leaving them frustrated initially, and perhaps quite down about things after a while longer living like this. A fellow counsellor commented to me recently that it would be helpful if we as therapists had a magic wand that could be waved in the air to change things immediately for clients. Indeed, sometimes that is what clients want their therapist to do, and when this quick fix is not possible the client can sometimes sink back down into the rut in which they find themselves. A large part of counselling is about what counsellors term therapeutic shift, which essentially means that the aim is for the client to make changes in their life which enable them to live in a more satisfying or productive way. Personal growth is the form this change takes, with the counsellor walking alongside the client as they tread their own personal path. It is not unusual for a client to arrive in the therapy room stating that they have "tried everything" and that "nothing has worked". Thomas Edison, the brilliant American inventor, once commented that "I have not failed, I've just found 10,000 ways that won't work". The decision to try again, to keep getting up, to not give in, is what can make the difference between successfully shifting out of one situation and into another. But how is this possible, you might ask? Surely after trying to remedy a situation many times over there is no point banging your head against the same problem? I would say that in instances like this, working harder at it is not the issue, but rather that there is a need to work smarter. In my experience with clients, it seems easier for us to try new things while already moving rather than from a standing start. To do something - anything - differently can be enough to help break the habits of being in the rut and can bring a fresh perspective, enabling creative solutions to be more easily found. What sort of changes do I mean? Well, perhaps eating a different breakfast cereal two days a week instead of the tried and trusted product you have consumed for many years, or walking the other way around the supermarket instead of following the well-trodden route. It might sound like these are only very small changes, unlikely to lead to any significant therapeutic shift, yet what we are doing here is getting ourselves used to change itself; how it feels, what new sensations it brings. Following the same staid routine can lead to us living almost on autopilot, in a state where we are not fully participating in our day and are just going through the motions. Breaking that cycle with new stimuli and novel experiences can be the first step towards bringing about change in other areas. Have you recognised yourself in any of what has been written above? 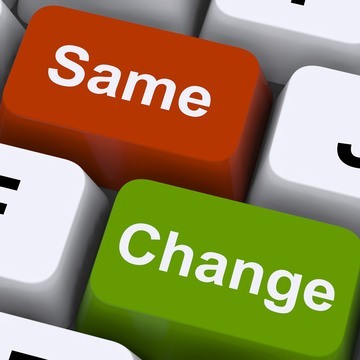 If you have, and feel that you would like to shape things differently, what one small change could you make that would differentiate today from yesterday? Once you have exercised your own personal power over several small aspects of your routine, perhaps you will eventually see that rather than being out of options, you could be at liberty to create your own. Keep going.